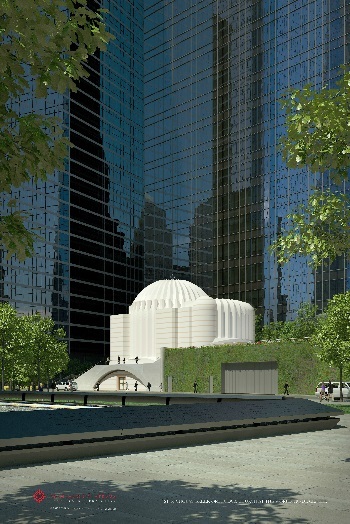 After 14 years, St. Nicholas Greek Orthodox Church in Manhattan is finally being rebuilt. When the south tower of the World Trade Center fell fourteen years ago, it dropped onto a little Greek Orthodox Church that stood in its shadow. Earlier this summer, St. Nicholas began to rise from the ruins. In August, the first concrete was poured for a new $35 million church and shrine, designed by famed Spanish architect Santiago Calatrava. “The purpose is to project something that will open a window to eternity,” Archbishop Demetrios, the primate of the Greek Orthodox Church in America, toldThe New York Times this week. After St. Nicholas Greek Orthodox Church, built by immigrants in 1916, was destroyed, only a few things were recovered in the ruins, including a crushed bell, a candelabra, a few Bibles, and some mangled candles, according to Religion News Service (RNS). “We remember this very place filled with ruins, hiding under piles of debris, the pulverized remains of 3,000 innocent victims,” Archbishop Demetrios told RNS last year. But while the 104-story “Freedom Tower” opened in 2014, reconstructing the little church—which only had standing room for 80—took more than a decade of negotiations. The Greek Orthodox Archdiocese of America spent years arguing with the Port Authority of New York and New Jersey, which owned the World Trade Centers, over where they could build and how much they would be compensated for giving up their old space. In 2011, the archdiocese filed a suit against the port authority, but dropped it after New York Governor Andrew Cuomo negotiated a deal between the parties. The new building, known as St. Nicholas National Shrine, will serve as both an Orthodox church and a public bereavement center. Though small—seating will accommodate 150 people in just over 4,000 square feet—the walls will be covered in thin slices of marble, appearing as solid stone during the day but able to glow (backlit with LEDs) at night. Former New York governor George Pataki, who was in office during 9/11, said during the groundbreaking last year that the church is a missing piece in the efforts to rebuild Ground Zero. The building should be finished next year. CT’s September 11 coverage includes how the day’s horrors are not unlike those of Good Friday, why theworld is becoming more violent, and how a cross-shaped beam from Ground Zero revived debate on how we see public crosses. More recently, Charles Featherstone shared his testimony of how September 11 saved him from Islam.